Today we’re featuring Christina Daniels, a fashion blogger who alters thrift shop finds and makes them her own. 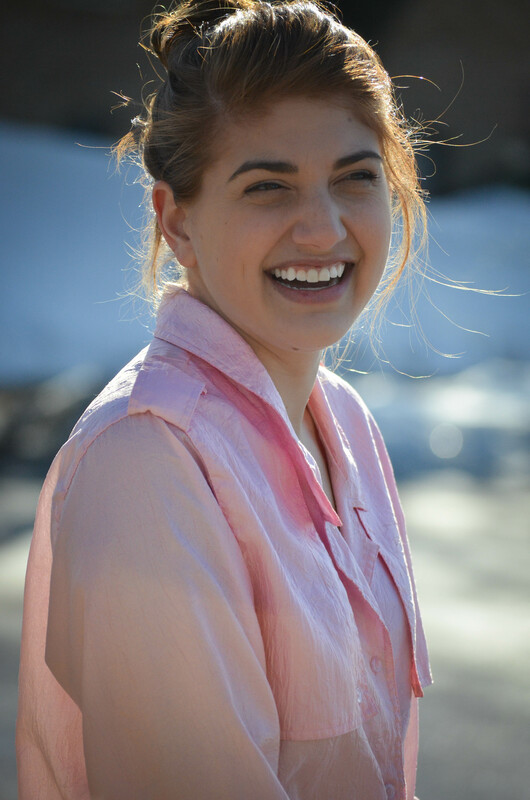 She has a strong background in fashion and is currrently studying fashion design and merchandising at Albright College. Ultimately, Christina would like to end up in Visual Merchandising or Styling, but has also had some great experience in Store Operations. She also runs her own website, called resourcefulrefinement.com which shows her personal thrift shop purchases while giving readers DIY tips to make these finds more fashionable. We’re amazed at how she can take something that is seemingly out of date or too large a size and then convert it to something you could see in a real high-end boutique. Christina was nice enough to do a DIY guide exclusively for Castle Foundations! 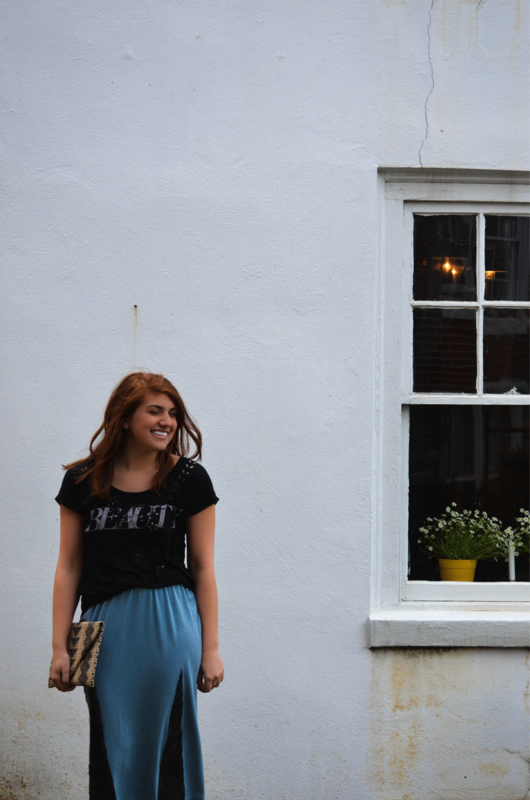 Check it out below and let it inspire you to be creative in your own fashion choices! Okay, so before we get started, there is something I must preface with. I apologize in advance for my nails and gross fingers. 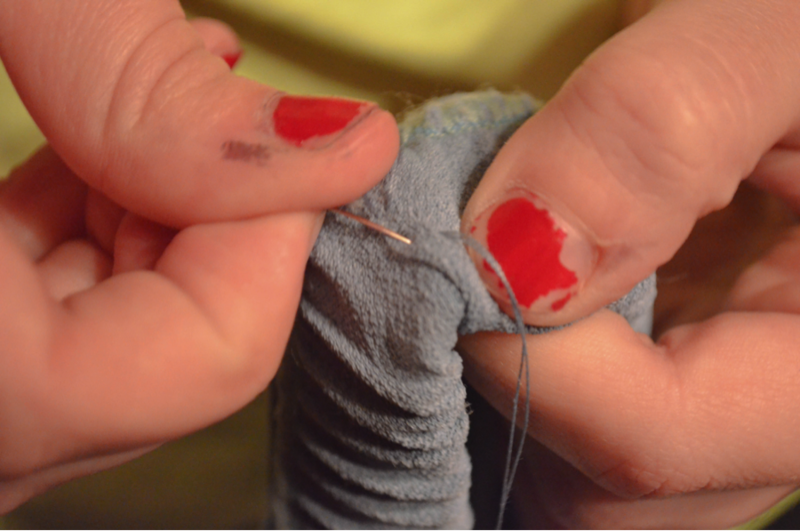 They were ruined and chipped after a botched batch of dye. But hey, we all have those days, don’t we? Now that I got that off my chest, let’s get started! Okay, so I prepared something special for all of you and I think you are going to love it! I found some inspiration for this DIY project from the Wes Gordon Spring 2104 line (link for photo here http://www.style.com/fashionshows/complete/slideshow/S2014RTW-WGORDON/#6). It is something very simple and elegant, but also easy enough that you can make alterations to suit your own style. So to start out, pick up a suitable blue skirt ($3.99) and lace ($2.99) from Goodwill. Most likely the lace will be cream or white, but don’t worry if you want to make it black. 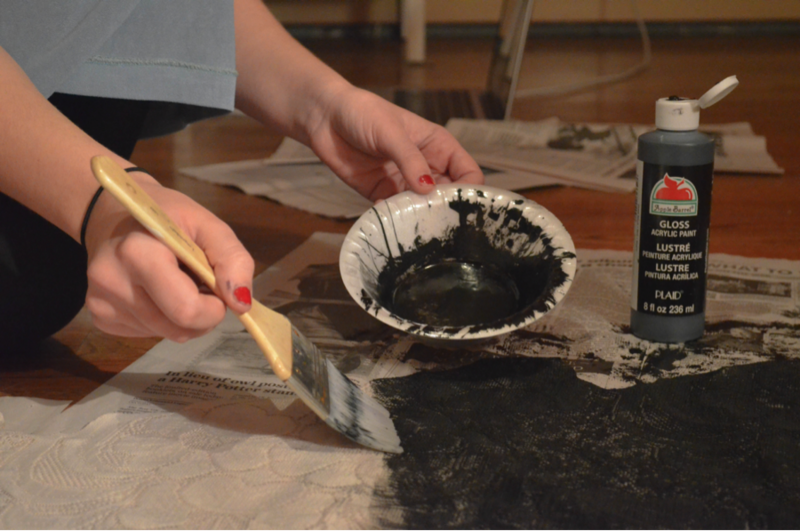 You can pick up Rit Dye at your local craft store, or if that doesn’t work (I know mine didn’t because of the fabric), you can also paint it black. You may need to check your linens section as mine ended up being an old curtain! I am very picky about my lace and wanted that similar style in Wes Gordon’s piece with the intricacies at the bottom of the lace, getting simpler towards the top of the lace. I had to take my skirt in a bit to make it fit how I wanted. I flipped the skirt inside out and pinned to where I wanted the sides to be. 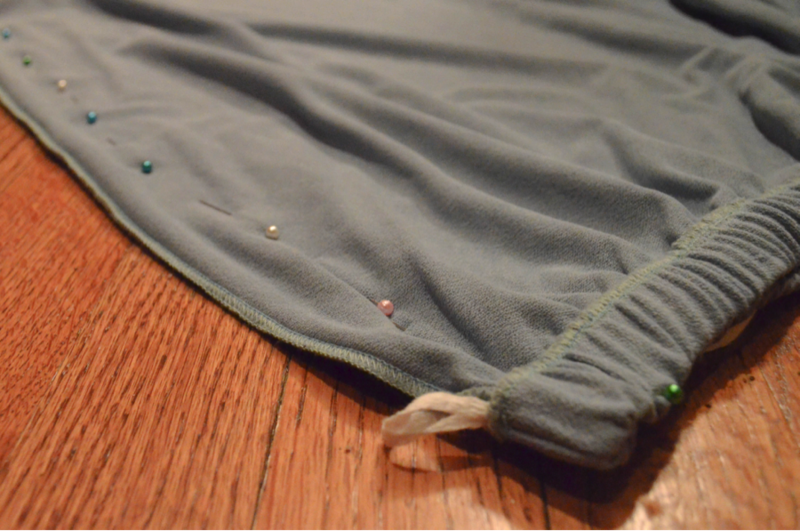 If you have elastic on the skirt, which you most likely will have, this is the tricky part. 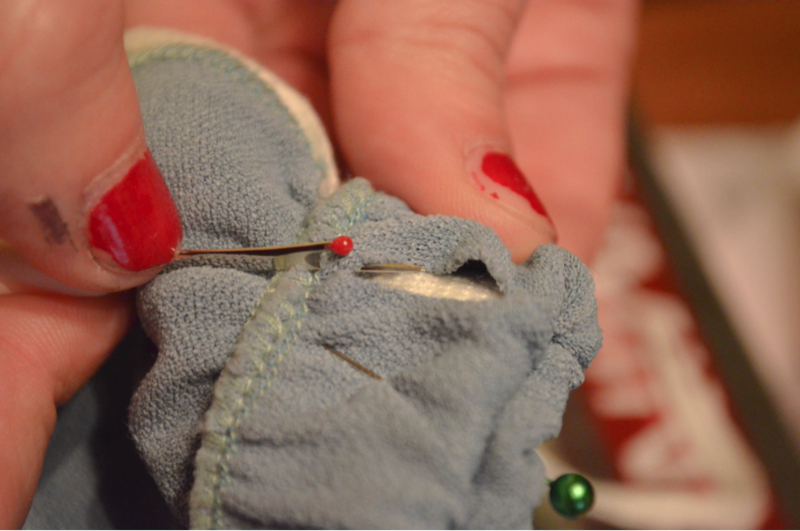 On the extra elastic band that you want taken off of your skirt, in order to take it in, cut open the fabric. Open it up so you have access to the elastic, but leave a good few centimeters on both sides by where you will need to take the skirt in. 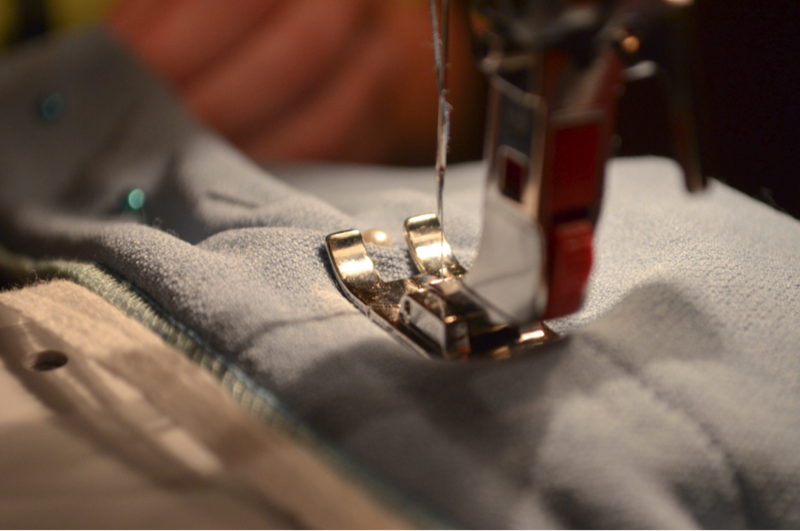 You will need the extra fabric to hand sew the waistband shut after adjusting the elastic size. 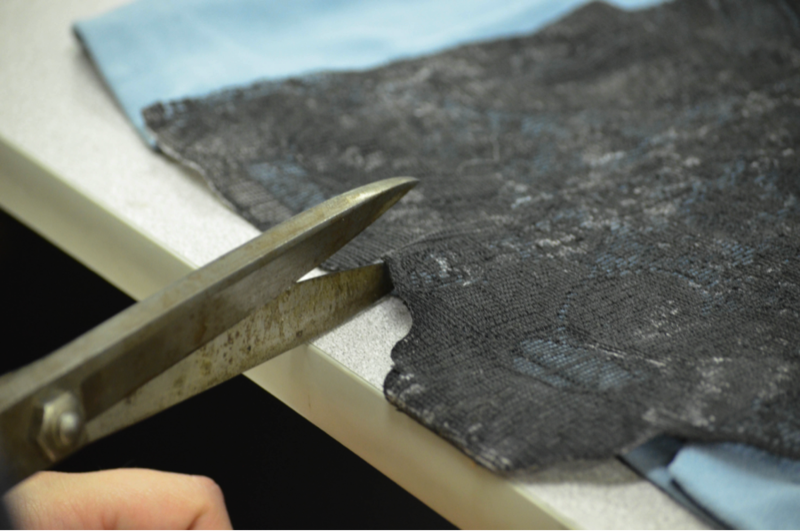 You may have to also cut the elastic out as well if it is sewed to the skirt. 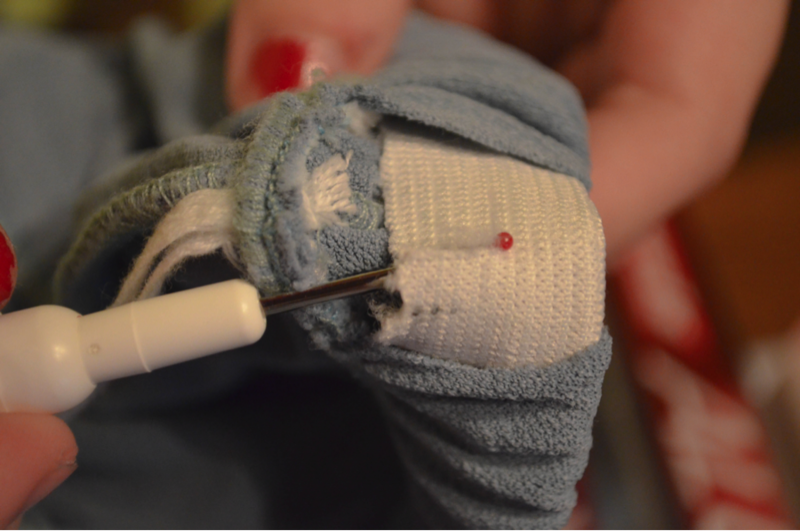 And cut it a few centimeters past where you opened up the fabric to give you some more room to sew. 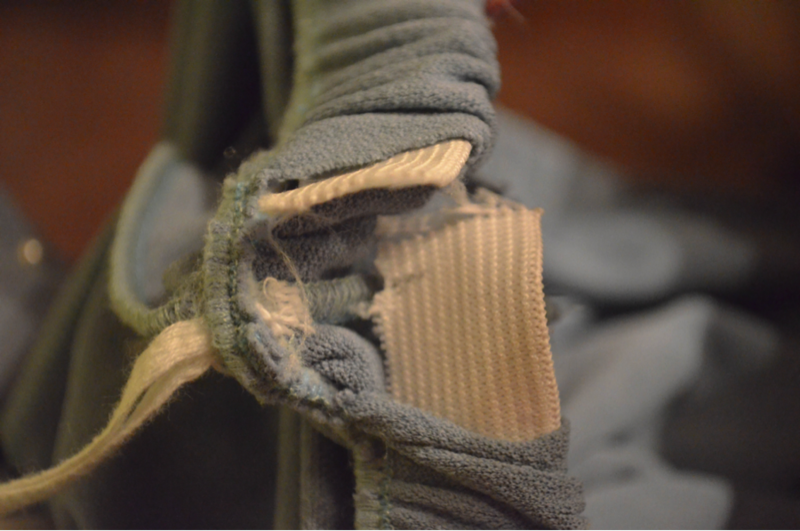 Cut the elastic in the middle of this extra section. Overlap the cut elastic (making sure it will lay flat when against the body) until the ends reach the point where you are taking the skirt in, and sew. Next, take the skirt in before hand sewing it closed. 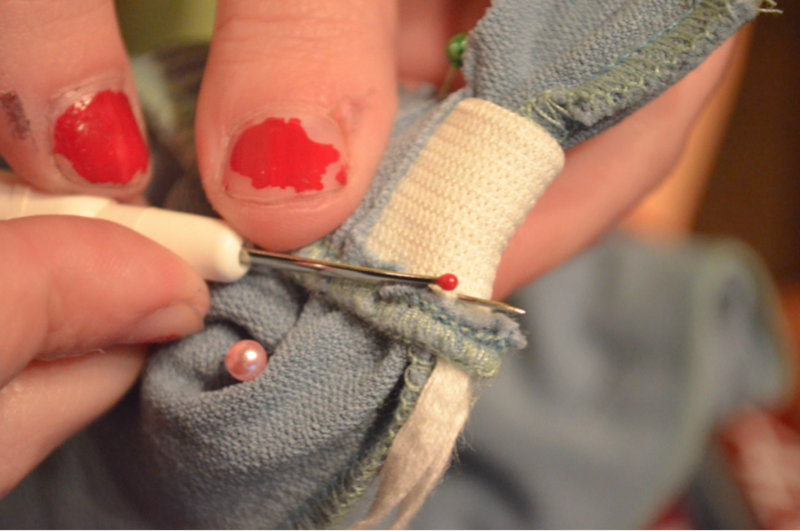 Once this is done, put your skirt on and decide where you want your lace slit to end. Take the skirt off and cut. It is a little terrifying but I assure you, you cannot mess it up! Now you are going to laugh at this next part, but position your lace where you want it and hot glue it to the skirt. Yes, I said hot glue. It makes it more manageable to work with and allows you to really align both sides since symmetry is key. I wanted a rougher look, so I glued my lace on top of the skirt and then cut off the excess after. 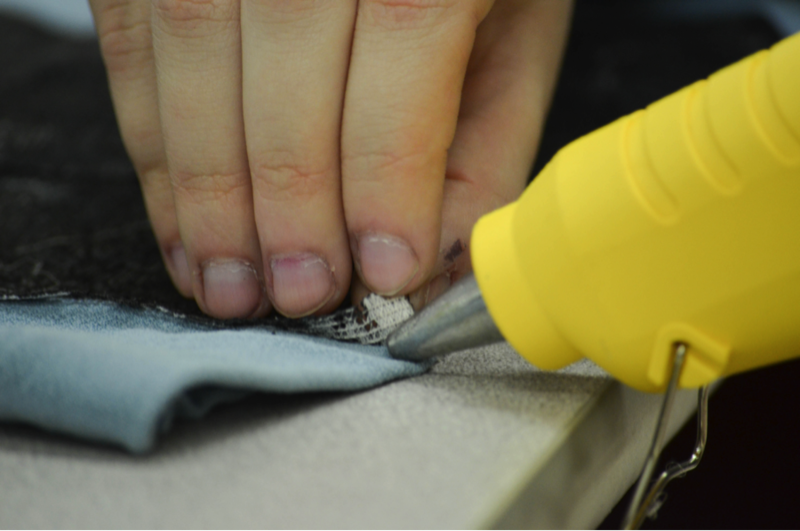 You can then reinforce the glue by hand sewing over it. I wouldn’t recommend using your machine over the glue as it might get stuck or break. Looks amazing, huh?! Can you believe it only cost $7 to buy the skirt and lace? If you find yourself staring at your closet wishing you had a new piece, try this or any of the great DIY pieces Christina has on her website. You will save a buck and feel really accomplished after making your own fashion masterpiece!